The legislation — known as a continuing resolution — funds the federal government for the first three months of fiscal year 2018, which begins Oct. 1, at the same funding level as fiscal year 2017. So McCain is right that the deal “freezes last year’s funding in place,” but only for three months. We won’t know the size of the defense budget until Congress passes a permanent funding plan. In an interview on CNN’s “State of the Union,” McCain criticized Trump’s support for a short-term budget plan proposed by the Democratic leaders. McCain voted against the bill, which Trump signed on Sept. 6. The bill — known as the Continuing Appropriations Act, 2018 and Supplemental Appropriations for Disaster Relief Requirements Act, 2017 — provided $15 billion in emergency hurricane relief, raised the debt ceiling and temporarily funded the government for the first three months of fiscal year 2018 at current levels. Asked by anchor Jake Tapper why he voted against a “bipartisan” bill, McCain — who chairs the Senate Armed Services Committee — said it would cut defense spending. 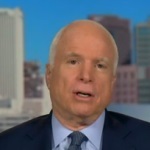 McCain, Sept. 10: [T]his agreement basically freezes last year’s funding in place, which is a cut of $52 billion. As we said, McCain is right about the funding freeze. But that freeze is only for three months, and the senator didn’t explain how keeping funding at the same level can result in a cut — let alone a $52 billion cut. We asked McCain’s office about the $52 billion “cut,” and we were told that McCain is actually referring to the difference between Trump’s request for $603 billion in base defense spending for fiscal year 2018, which begins Oct. 1, and the $551 billion in the base defense budget for fiscal 2017, which ends Sept. 30. There are two issues with McCain’s math: He exaggerates the difference between what Trump proposed for the total defense budget and the continuing resolution, and there hasn’t been an actual cut in spending. Trump is proposing an increase in total defense spending — not just base defense spending — of $34 billion, according to the nonpartisan Congressional Budget Office analysis of the president’s proposed budget for fiscal year 2018. As we have written before, CBO has said Trump’s proposed FY2018 budget would increase defense spending by 5 percent. “For defense discretionary programs in 2018, the President proposes appropriations of $668 billion, which would be $34 billion (or 5 percent) more than the amount provided in 2017,” CBO said. The $668 billion includes $603 billion in base defense spending and $65 billion for overseas contingency operations, or OCO, which fund ongoing military operations in the Middle East. McCain was referring only to the base defense spending, not the total amount. Todd Harrison, a defense budget expert at the Center for Strategic and International Studies, told us it makes more sense to use the total defense budget, rather than just the base defense budget, when comparing the impact of congressional funding. Harrison also told us that McCain’s use of the word “cut” is wrong, or “at a minimum unclear,” because the senator didn’t explain that he was comparing the funding to proposed funding, not the actual current funding level. This is not to say that a temporary fix that continues funding at the same level will not have an impact on the Defense Department. McCain may have a point about that. The current fiscal year is a good example. Congress twice extended government funding this fiscal year with continuing resolutions. The first CR provided defense funding for the first three months of fiscal 2017 that was $5.3 billion, or about 1 percent, less than the department’s fiscal 2017 funding request (see table 1 of the CRS report). The second CR, which extended funding through April 28, provided more than $9 billion in additional funding for the Defense Department, including $8 billion extra for overseas contingency operations. In May, Trump signed the Consolidated Appropriations Act of 2017 that provided permanent funding for the remainder of fiscal year 2017 — including an additional $21 billion for the military. As a result, the Defense Department received more money than it initially requested for fiscal 2017. The White House says it will continue to seek the defense funding requested in the president’s budget for fiscal 2018. We will have to wait to see what happens, but we can say that the actions taken so far have not created a $52 billion cut in defense spending. Updated, Sept. 12: This has been updated with a response from the White House. President Donald Trump’s deal with Democratic leaders “basically freezes last year’s funding in place, which is a cut of $52 billion” in the defense budget.